The Local asked Kim Davis, the food maven behind At the Sign of the Pink Pig, to find the neighborhood’s best brunch biscuit. Luckily, he didn’t flake. Noah Fecks The biscuit at Bobwhite Lunch and Supper Counter. The East Village – traditionally a neighborhood of pierogies and kielbasa – has lately reached below the Mason-Dixon line for comfort foods. Suddenly, we can’t get enough biscuits! Witness the appearance of Bobwhite Lunch and Supper Counter on Avenue C. Its excellent dark-meat fried chicken with a brittle crust comes with impeccably fresh salad and a warm, buttery biscuit ($9.50). It’s a small, naked biscuit, though, and only made me hungry for that brunch-only delight: biscuits and gravy, just like somebody’s grandma – not mine – probably used to make. 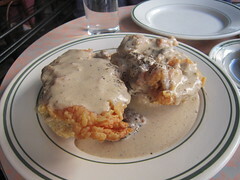 Kim Davis A biscuit with fried chicken and gravy at the Cardinal. The Cardinal, another relative newcomer, is primarily a barbecue joint on two levels, with a kind of Creole junkyard look, and cheerful servers in beards and baseball caps. One of the painted slogans on the walls warns of “lard biscuits,” but these biscuits were nothing special – flat, crumbly and completely upstaged by their fried chicken topping. The ivory-colored gravy distinguished itself by being warmly spiced, as was the house-made sausage freely crumbled into it. The biscuit with fried chicken is $15; it’s big enough to serve two. Kim Davis A pair of biscuits from Mama’s. A block away, Mama’s Food Shop is no carpetbagger. For some sixteen years, it’s been serving up its own idiosyncratic version of soul food, made and served in bulk, at basement prices. The biscuits themselves (which come two to a serving) are bulky, gnarled and bready. The gravy, simmering proudly under a tangible skin in a deep pan, is very gray, intensely salty, and packed with garlic. It’s also stiff enough to serve as a light glue. The traces of commercial Italian sweet sausage in the dish could be excused by the price: at $7 ($8 with “hash”), this was cheap as well as filling. Thanks to big windows overlooking The Bowery, the upstairs bar at Peels is one of the neighborhood’s sunniest spots to take brunch. A pity the food was charmless. If you must charge fifty cents extra for gravy with the biscuits, offer more than a teaspoonful smeared meanly around the plate. I mean, this is basically flour and water, not caviar. It’s red-eye gravy here rather than white, which implies the inclusion of ham or bacon drippings (usually coffee too), and indeed it was scattered with tiny cubes of pork fat. “Build your own biscuit” is a popular option, allowing you to stack your plate with everything from scrambled eggs to fried chicken and avocado. 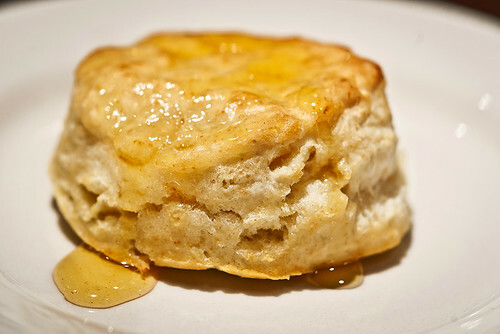 The “classic buttermilk” biscuits may look proud and puffy, but they’re bone dry. Dry as sawdust. An oversweet sausage patty didn’t make up for the disappointment. Biscuits are $3, the toppings separately priced. If you’re lucky enough to shoehorn yourself into a seat for brunch at Northern Spy Co., you might just eat the best biscuits in the East Village, made that morning. Small, yes, but feather-light and buttery, served in snow-white gravy, with nuggets of house pork sausage. Fresh parsley is chopped on top. It’s all so perky and clean, it almost feels like health food. 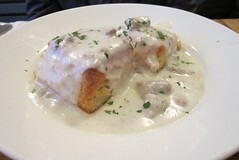 Biscuits and sausage gravy, $9. 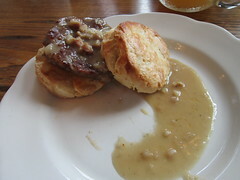 If Northern Spy Co. takes the cake for biscuits, honors for gravy go – by a hair – to The Brindle Room, Jeremy Spector’s narrow dining room and bar. 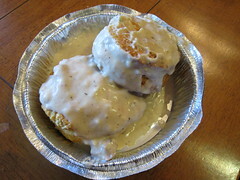 The biscuits here are good enough, with a little toasty crunch to them, but the off-white gravy is sensational. I asked why it was so savory, but all I could wring out of my server was: “It’s his recipe. He’s from Oklahoma.” I did find out that he uses his own sausage. Since the sausage didn’t appear in big chunks, my best guess is that it breaks down thoroughly and helps give the gravy its meaty richness. 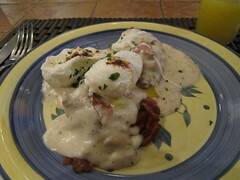 The dish ($11) comes topped with crisp bacon and poached eggs. One thing I found out: Southern classics are every bit as heavy as our historic Eastern European traditions. Push those biscuits a little closer if you don’t mind. Previous post The Day | L.E.S. Business Owner Killed On F.D.R.